Test your trading system on multiple securities using realistic account constraints and common portfolio equity. Trade portfolios to decrease risk/reward ratio. 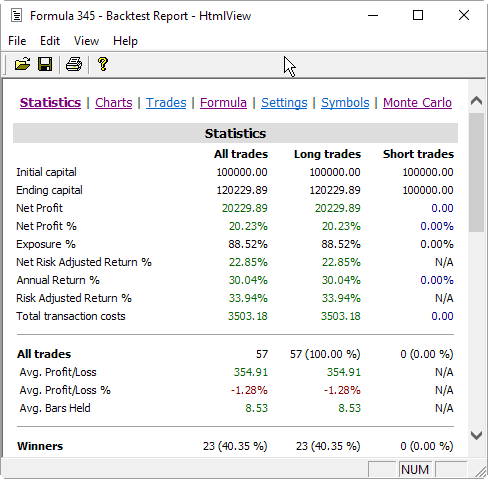 Find out how changing the number of simultaneous positions and using different money management affects your trading system performance. 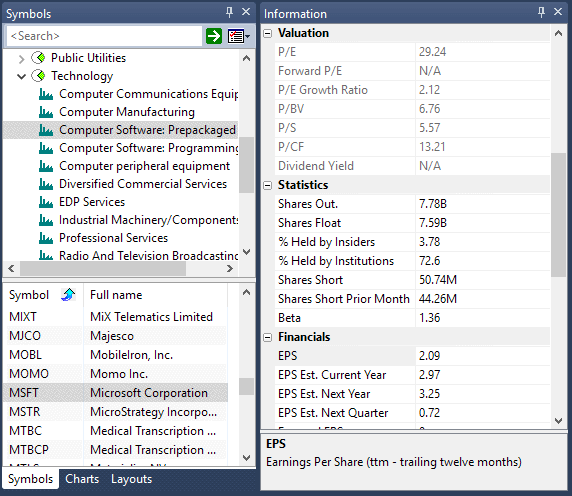 Use current portfolio equity (sum of cash and all simultaneously opened positions value) to calculate new trade size, or use any other position sizing method by specifying dollar value or number of contracts/shares. 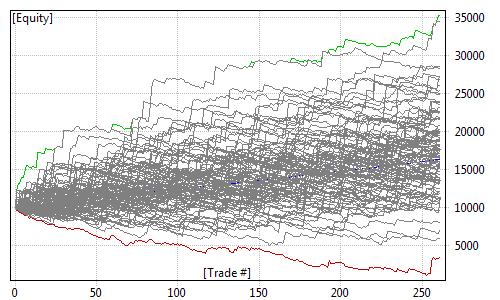 Position size can be constant or changing trade-by-trade. Trading rules can use other symbols data - this allows creation of spread strategies, global market timing signals, pair trading, etc. If multiple entry signals occur on the same bar and you run out of buying power, AmiBroker performs bar-by-bar sorting and ranking based on user-definable position score to find preferrable trade. 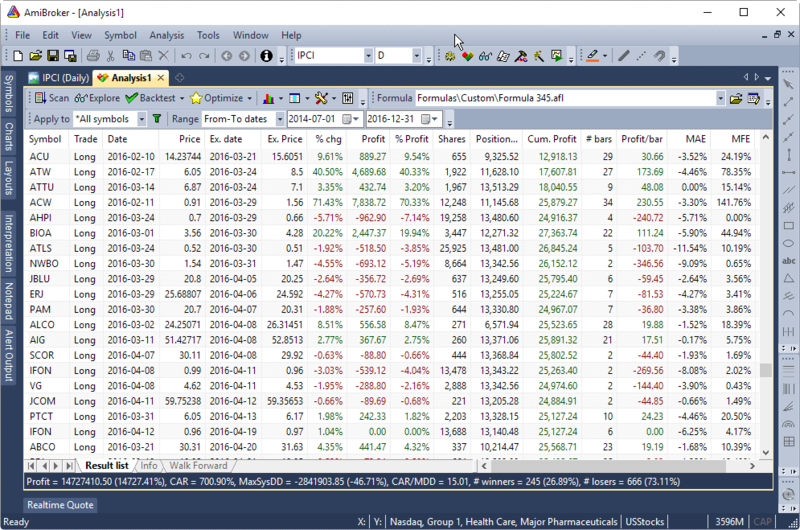 In AmiBroker Formula Language (AFL) vectors and matrices are native types like plain numbers. To calculate mid point of High and Low arrays element-by-element you just type MidPt = ( H + L )/2; // H and L are arrays and it gets compiled to vectorized machine code. No need to write loops. 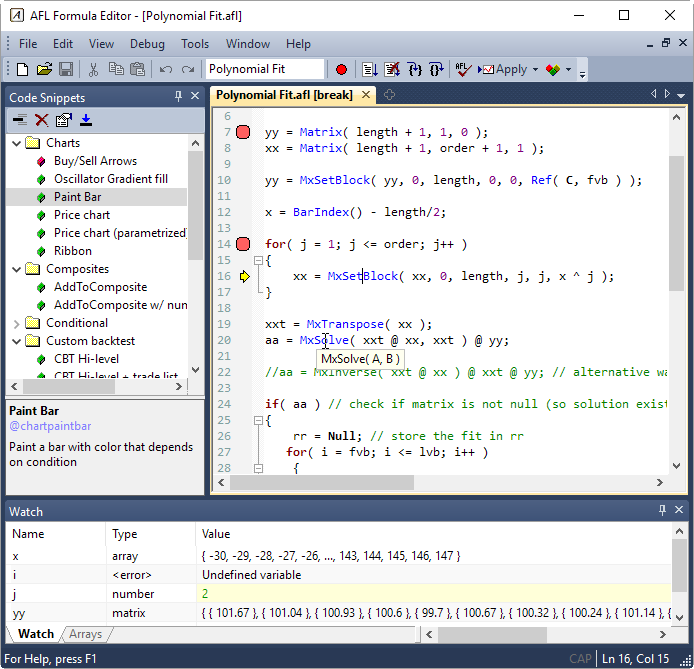 This makes it possible to run your formulas at the same speed as code written in assembler. Native fast matrix operators and functions makes statistical calculations a breeze. 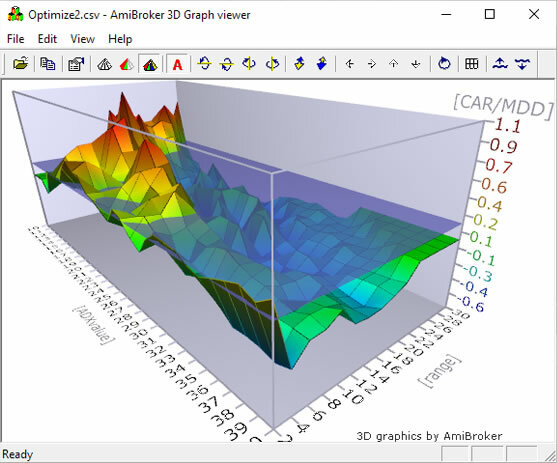 AmiBroker is written in C++ (compiled to machine code), the same language in which operating systems are written. It runs natively on the CPU without need of any kind of virtual machine or byte-code interpreter, unlike Java or .NET programs. The fact that CPU runs native machine code allows achieving maximum execution speed. The AFL language can process as much as 166 million data bars per second on 2GHz CPU, see this for details. 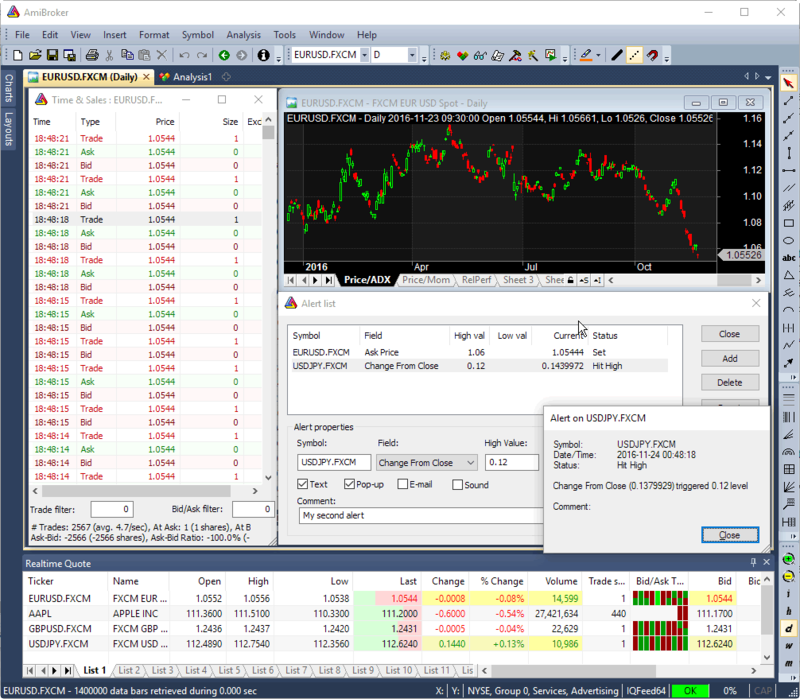 The AmiBroker code has been hand optimized and profiled to gain maximum speed and minimize size. Small code runs many times faster because it is able to fit into CPU on-chip caches. Full setup program with example database and help files is just about 6 (six) megabytes, half of that is documentation and data. The executables alone (.exe and .dll libraries) are just 3.5 MB. 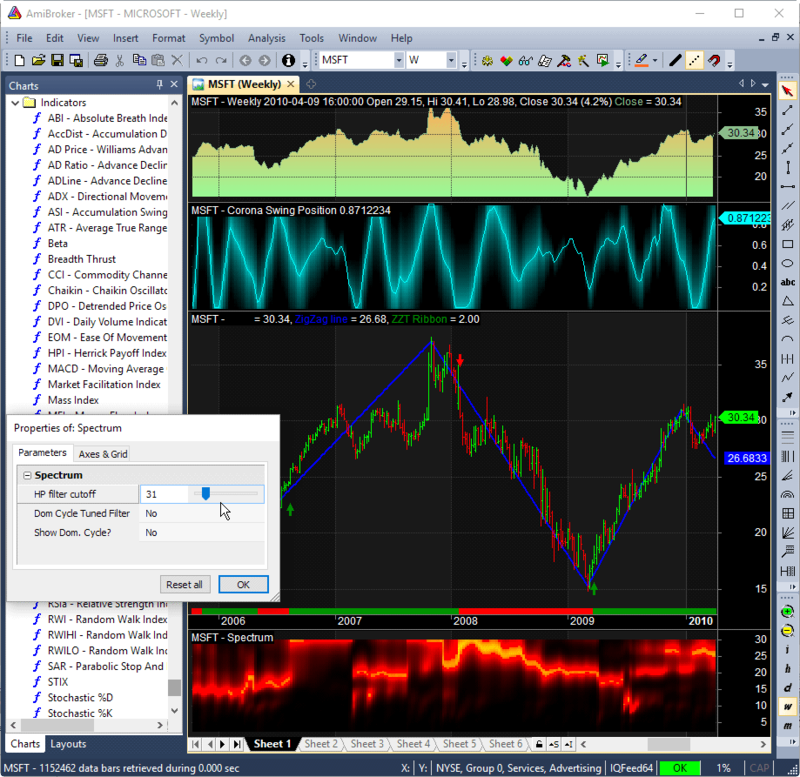 In today's world of bloatware we are proud to deliver probably the most compact technical analysis application.